People make things happen in your community. People like these people. 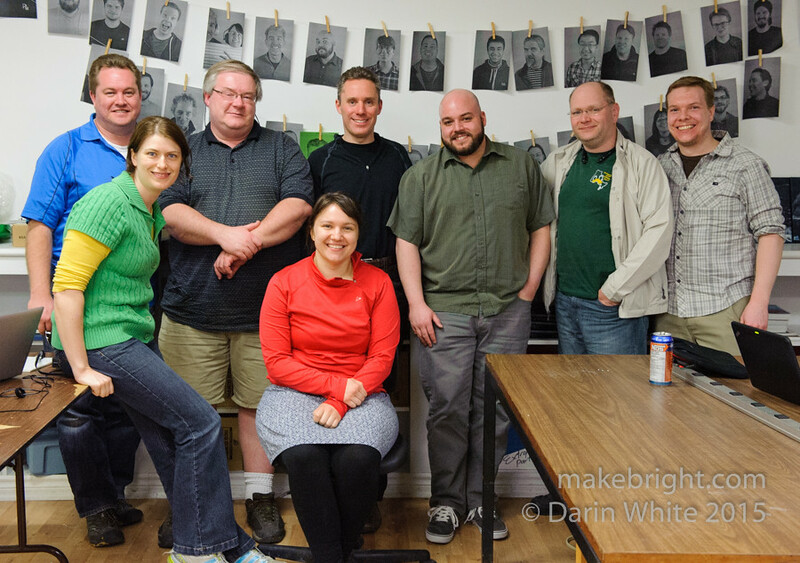 Left to right: Cam Turner (of Maker Club), and from kwartzlab, Christine Van Walraven, Neil Eaton, Agnes Niewiadomski, Matt Bells, Ben Brown, Darcy Casselman, James Bastow, and then from makebright there’s me, Darin White behind the camera. We met up Friday to get our planning freak on, ‘cause that’s how we party. I’m a few meetings behind, but I catch up fast. We’re working on a community event that is going to celebrate makers of all stripes and the stuff they make. We’re hoping you will support/sponsor/help/volunteer/exhibit/teach and above all, show up. Details are coming soon. I’ll keep you plugged into the meta as usual. From Charles and Kent, this is Kitchener. This entry was posted in event and tagged Kitchener, makeosphere. Bookmark the permalink.